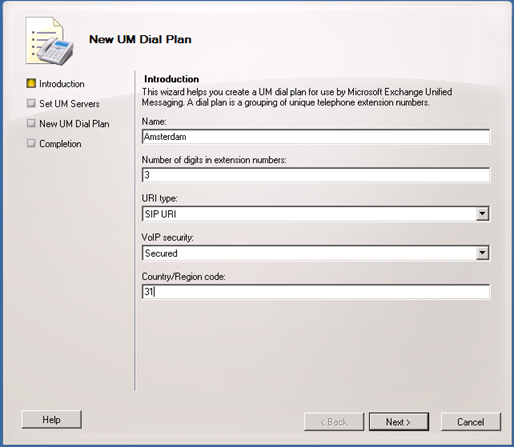 In the Exchange Management Console select the Organization Configuration leave an in the Actions Pane select New UM Dial Plan. Enter a Name, the number of digits in the extension numbers, the URI type (SIP URI for Lync), VoIP Security (Secured for Lync) and the Country code of the country you are working in, i.e. 31 for The Netherlands, 33 for France, 44 for the United Kingdom or 1 for the US. Click Next and click New to create and configure the new Dial Plan. You will see a warning message about the UM Startup Mode. 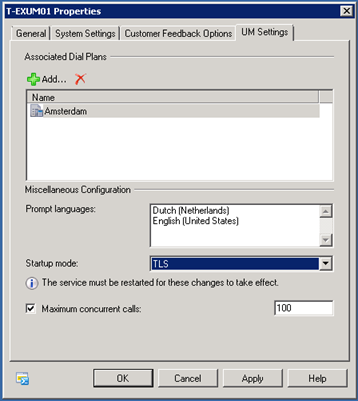 The VoIPSecurity type of dial plan(s) ‘Amsterdam’ does not match the UMStartupMode of Unified Messaging server ‘T-EXUM01’. Please ensure that if the UMStartupMode of the Unified Messaging server is TCP, the dial plan has a VoIPSecurity type of Unsecured. If the UMStartupMode of the Unified Messaging server is TLS, the dial plan should have a VoIPSecurity type of either SIPSecured or Secured. All traffic between the Lync servers and the UM servers is encrypted so UC certificates need to be installed on the UM servers. This can be a self-signed certificate but I prefer to use regular certificates. In the internal network a UC certificate from the internal CA can be used. Before adding certificates make sure that the UM service startup type is set to TLS instead of TCP which is the default. Open the properties of the UM server and select the UM Settings tab. Change the Startup mode to TLS and click Apply (or OK). 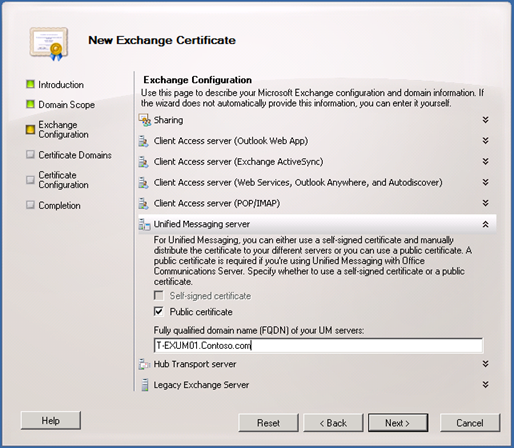 To request a new certificate open the Exchange Management Console, select the Server Configuration container and in the results pane select one of the Exchange 2010 UM servers. In the Actions Pane click on New Exchange Certificate. Follow the wizard and enter the correct data. 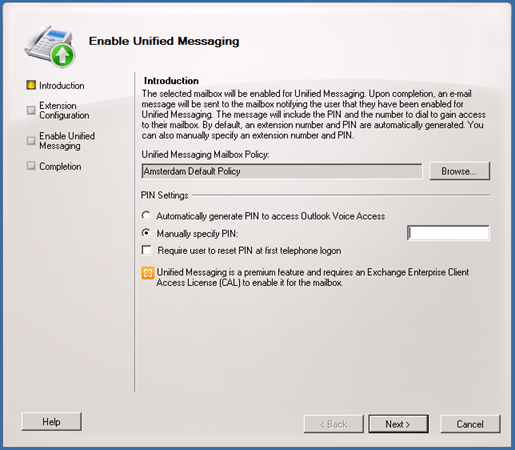 In the Exchange Configuration window it is sufficient to only select the Unified Messaging server and since a UC Certificate from the internal CA is used you have select Public Certificate and make sure the UM Server is listed. Finish the wizard and use the internal CA to request the certificate. Once the certificate is returned use the EMC to finish the new certificate wizard using the Complete Pending Request option. Once installed use the Assign Services to Certificate option to assign the Unified Messaging (UM) service to the new certificate. Creates an Exchange UM hunt group for each IP gateway. The hunt group pilot identifier will be the name of the dial plan associated with the corresponding gateway. 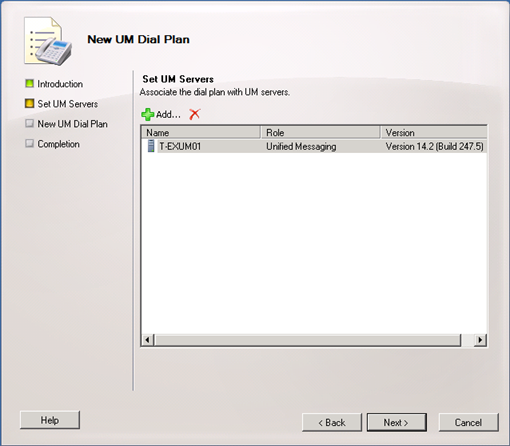 The hunt group must specify the Exchange 2010 Unified Messaging SIP dial plan used with the UM IP gateway. A UM Mailbox Policy is automatically created, you can see this in the Exchange Management Console, under the Organization Configuration leave and then the UM Mailbox Policies tab. Review this (default) policy and edit as appropriate. 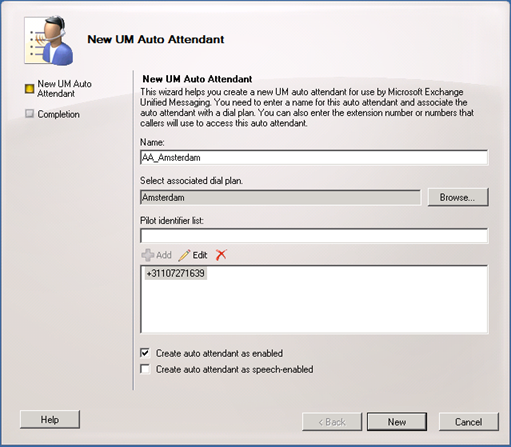 To configure the Auto Attendant or Subscriber Access select the UM Auto Attendants tab (next to the UM Mailbox Policies tab from the previous step) and click New UM Auto Attendant in the Actions pane. Click New to create the new Auto Attendant and click Finish to close the wizard. To create the necessary contact objects in Active Directory for the Auto Attendant and Subscriber Access you can use the OcsUmutil utility which can be found in the C:\Program Files\Common Files\Microsoft Lync Server 2010\Support directory on the Lync Front-End server. 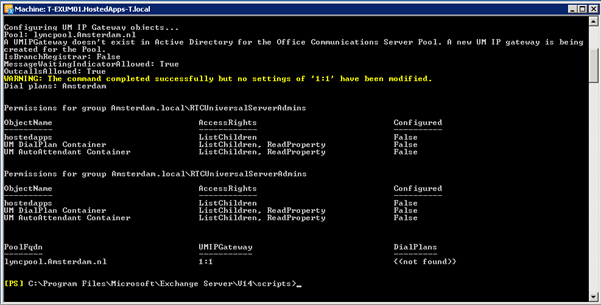 The tool scans the Active Directory for Exchange UM settings and allowing the Lync Server administrator to view, create, and edit contact objects. Start the tool and click the Load Data button, this will start the scan of Active Directory. It finds the Active Directory forest (duh!) and the Dial Plan we created in the beginning. Click the Add button to create the contact for the Subscriber Access service (and the Auto Attendant when needed). Click OK to store the information in Active Directory and close the application. To enable a mailbox for UM select the recipient in Exchange Management Console and click Enable Unified Messaging in the Actions Pane. In the wizard select the UM Mailbox Policy and enter a PIN for the user (or let the system auto generate a PIN). In the next window enter a mailbox extension, the extension is typically the last x digits of the user’s phone number. The SIP resource identifier (i.e. the user’s SIP address) can be auto generated or you can manually enter this identifier. Click Next to continue and click Enable to UM enable the mailbox. Click Finish to close the wizard. 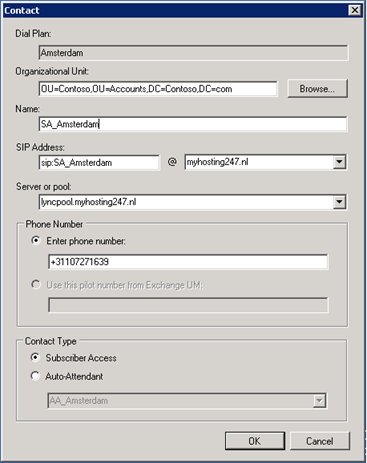 Lync Server 2010 and Exchange 2010 UM are now connected and the user’s mailbox is enabled and it’s time to start (user) testing.